Colin Wilson, last season’s top Terrier freshman scorer and the 2008 first round draft choice of the Nashville Predators, has decided to return to BU for his sophomore season, according to several sources close to the program. At the time of the draft, Nashville GM David Poile voiced his inclination for Wilson to continue his career at BU for at least another season, noting, “we think he is in a good place.” During Predators prospect development camp that Wilson attended, Coach Barry Trotz stated his preference for not rushing young players. Wilson’s ultimate choice may have been between returning to BU and playing with Nashville’s AHL affiliate in Milwaukee. 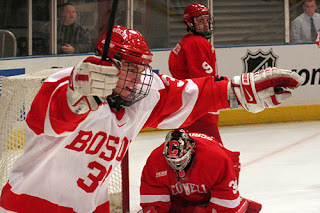 By returning to BU, the 6-1, 215 centerman will emulate his father, former NHL winger Carey Wilson, who skated for two seasons at Dartmouth before beginning his professional career. Carey Wilson scored 60 points during his Big Green career. Colin had a 12-23-35 line last year for BU.